Proud of seafood and riches of the soil. It's called Miketsu-kuni and Umashi-kuni. Mie is a treasure trove of food that is renowned around Japan and throughout the world. Below is a selection of the best that Mie's farms and seas have to offer. Matsusaka beef was named Japan's best beef after receiving the top prize at the 1935 All Japan Meat and Livestock Exposition. Matsusaka cows are fed quality feed designed to keep them healthy, while they are fed beer to stimulate their appetites. They are also massaged with shochu, a distilled liquor. The meat features an exquisite marbling of fat, making every cut appear like its own work of art. 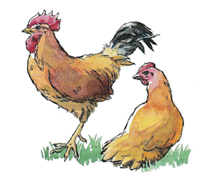 A combination of the Yakido chicken (a variety that is native to Mie), Ise Akadori chicken, and Nagoya Kochin chicken, these prized birds are raised in large barns where they are free to roam around. They are fed Kumano rice grown as animal feed as well as local citrus fruits, and their drinking water comes from the pure valley waters that flow by Kumano Kodo. Top chefs from all over the world seek out this chicken's rich, fleshy meat. Iga beef's bright color, richness of aroma and flavor, and its unique tenderness have helped it become an eminent brand in Japan. Having been mentioned as far back as in an early 14th century tome, it has a long history. It is said that ninja once carried Iga beef jerky as emergency rations. Iga cows continue to be exchanged between buyer and seller the old fashioned way?through face-to-face meetings at the farm. For over 2,000 years, ama divers have been fishing for abalone in reefs off the cities of Toba and Shima. Those abalone caught in the Kuzaki area of Toba are especially sacred and are offered to Ise Jingu. You can try a taste of fresh abalone in the huts where ama take a break after diving. There, the ama grill their catch over charcoal until they are bursting with juices. This puffer fish is caught primarily around Anori Harbor in Shima Peninsula. Each fish weighs over 700 grams and has a ferocious look that belies the tenderness and sweetness of its pink flesh. It is in season during fall and winter. During this time, ryokan inns and dining establishments in the area serve puffer fish courses that include sashimi, casseroles, and other dishes. 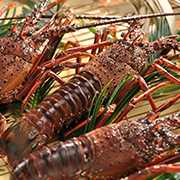 se lobsters are raised in the ecologically rich Ise Bay and the nutrient-rich Kuroshio Current. As a result, their flesh is juicy and sweet, whether eaten raw, grilled, or boiled. The fishermen take particular care to maintain this flavor by gently removing each lobster from their nets, one at a time. Smaller lobsters are returned to the ocean, and a ban on lobster fishing is in place during breeding season. In Japan, red seabream is considered the king of fish, a delicacy traditionally served as a symbol of good fortune at weddings, rites of passage, and other celebrations. It is fished all year round, but red seabream caught in the spring just before breeding season is especially fatty and delicious. Mie's wild seabream are primarily fished in the Kumano Sea, but those caught via handline at the mouth of Ise Bay are particularly meaty. The fish is also farmed. Technological advances in recent years have made it possible to farm red seabream that offer the same rich quality and deep red skin as their wild equivalent. Oysters are widely cultured off the coast of Mie, from Ise Bay to Kumano Sea. The waters are rich with minerals, so the oysters grow a year faster than in other parts of Japan, making them especially plump and sweet. Each oyster is raised in its own cage to ensure its health. Oysters meant for raw consumption are washed in seawater and then disinfected with UV rays. Matoya, Uramura, and Watari oysters are Mie's most famous. Mie rock oysters that are caught in the spring and summer are bigger and more robust in flavor than those caught during fall and winter. 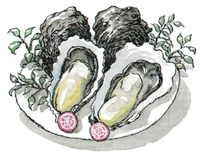 Squeeze some fresh lemon juice over a cooled rock oyster and slurp it off its shell to enjoy its briny aroma and creaminess. Sea lettuce is widely farmed throughout Mie, from the mouth of Ise Bay?where nutrient-rich river water combines with warm seawater brought in by the Kuroshio Current?to the Kumano Sea. Mie is, in fact, Japan's largest producer of sea lettuce. This becomes evident during the wintertime, when the waters off of the Shima region are cast completely green. Rocked by gentle waves and painstakingly attended to by farmers, the sea lettuce turns a deep shade of green as it becomes more fibrous, and its rich, briny aroma intensifies. 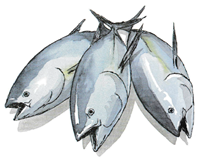 A wide variety of tuna can be found in Mie?from wild tuna caught both in coastal and distant waters, to quality farmed tuna. 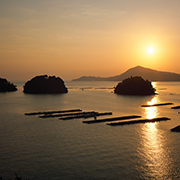 Both fishermen and fish farmers take great care to preserve the quality and freshness of the fish, so visitors are guaranteed to find high-quality tuna anywhere they travel in Mie. Ise hijiki makes up seventy percent of all hijiki consumed in Japan. These brown sea vegetables grow on rocks in the shoals of Ise Bay, where they develop into thick strands that are very rich in flavor. Soon after being harvested, they are dried outdoors and put back in water to rinse off the residual salt. After this, they are steamed at high temperatures, and then dried again. 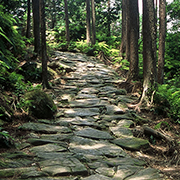 This process gives Ise hijiki its distinctive softness. Koshihikari rice is produced throughout Japan, but the brand grown in Iga has been particularly blessed with optimal climate and soil conditions. It has been named one of the best in Japan. There is also a local variety of rice called Mie 23-go. One Mie 23-go brand, Musubi-no-kami, was hand-selected to be cultivated as a premium item. When cooked, its grains expand nicely and are imbued with a rich sweetness that comes forward at first bite. Japanese and Western restaurants alike use this rice for a variety of dishes, from rice balls to risotto. The Nanki region enjoys a warm climate throughout the year, due to the Kuroshio Current that passes through the nearby Kumano Sea. This is why mikan oranges are grown here all year round. These fruits are indigenous to the area, and come in a variety of delicious flavors, ranging from sweet to sour, that lend themselves to a wide array of beverages and dishes. 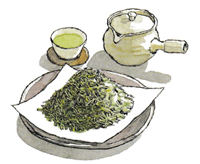 Ise tea ranks third in production among all of Japan's teas. The taste is a fine balance between sweetness and bitterness, and its aroma is subtle and enchanting. Ise tea has won several awards at tea competitions. 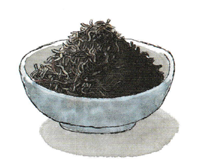 There are many local techniques to preparing the tea, such as covering the tea leaves in a dark cloth before picking them to reduce their bitterness, and steaming the leaves for a long period of time to give them a more mellow flavor. Sake is made from fermented rice, but it is not just the quality of the local rice that makes Mie's sake so exceptional. The prefecture's rich culinary culture, its ideal climate, and the purity of its water also contribute to its flavor. There are 35 distilleries throughout Mie that offer a wide range of sake that compliment a variety of cuisine. Many of their products have earned high marks at sake contests around Japan. Copyright© 2016 Mie Citizens Council for The Ise-Shima Summit All Rights Reserved.